The answer is NO and here’s why. Last year, calls for an election boycott were louder and it still had little effect. This year the calls are hesitant, and weak. In another article, I discuss the historical lack of effectiveness and the dangers of election boycotts in general (Egypt, how effective are election boycotts?). Here I wish to focus on the situation in Egypt today. For a boycott to work there are several requirements, none of which are currently present. First, you need to campaign early and campaign hard. On the contrary, there are very sophisticated campaigns to encourage people not to give up their vote. Additionally, the army has changed electoral system from non-compulsory to compulsory. Now, those that don’t vote are fined 500 LE, a significant amount of money by Egyptian standards. Of course, in a compulsory voting system, abstaining from the vote amounts to civil disobedience. But unless the boycott is accompanied by other measures which hinder ability to govern or there is minimum voter participation required the effects are irrelevant. Second, for the election boycott to work it needs to happen both at the candidate level in addition to the electorate level. In 2010, key opposition party leaders, including the Ghad party, the Democratic Front, Kefaya and National Assembly for Change all called for the boycott. This year, all the main players have suggested we take part. At least that’s the situation till now. What are the odds if we do participate? So, there are approximately 45 million eligible voters in the country. There are an estimated twenty to thirty million new potential voters this year. According to the National Voter Survey, conducted and published by Al-Ahram Centre for Political and Strategic Studies (ACPSS) in August, a large turnout is to be expected with more than 80% saying they are likely to vote. Moreover, a majority (more than half) of voters were still undecided. Thirty one percent (31%) of the decided voters say they will vote for the Brotherhood’s Freedom and Justice Party (FJP). Approximately 15% of decided voters said they will vote for the Wafd which has recently broken a controversial electoral alliance with the FJP. According to the poll half of the total electorate sample viewed the FJP favorably while the other half views it unfavorably. This result contrasts with the perceived “Revolutionary Youth Coalition” which was came out ahead (44% favorable vs. 24% unfavorable). Interestingly, 17% of decided voters said they would vote for the “Revolutionary Youth Coalition”. Obviously, no one can deny that NDP affiliates have an upper hand in rural Egypt. 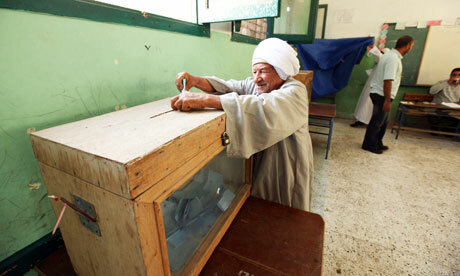 There are also an estimated 8 million Egyptians expats which will vote for the first time. No one knows which way those votes will go especially for those living the Gulf region. Then there are the Egyptians living in Europe and Northern America… again it’s anyone’s bet. But most important of all are the Copts, Egypt’s largest minority. Last year, they cast their votes for Mubarak’s NDP, this year they are a dominant force. That’s why any indications that they will abstain is very troubling. The Coptic vote could to a certain extent turn the tables. Unlike the referendum where a majority win determines the outcome, in a general election, the more or less representative nature of the process allows for smaller but crucial victories [Note to self: Al-Ahram’s poll was conducted prior to the events in Maspero]. From 2005 to 2010, the opposition’s representation in parliament was at an all-time high, thanks primarily to the Muslim Brotherhood; however, the NDP was still able to pass all of its proposals. This makes me personally and ideologically, not in favor of casting my vote for the Islamists. Of course the times have changed… or have they? So, we’ll still end up with a coalition government similar to the parliament in 2005, but this coalition will be as dismal as we allow it to be. We need to form a loose network of candidate names that we would all loyally vote for. A loose network, like the one the previously banned Brotherhood formed when it won 20 percent of parliamentary seats in 2005. Or like NDP affiliates are forming this year from their network of “independents”. Wishful thinking perhaps, but it’s our best shot. So this is a call to all “pro-revolutionary” activists: to the Marxists, Trotskyites, and Liberals need to leave their quarrels behind. And no, it’s not the time to fight for Social Justice versus Free Markets. This is a time to unite. It’s time to fight for freedom! « Egypt, how effective are election boycotts? I agree with the argument against boycotting. It adds no value at all. I actually do not even really understand why people would want to boycott the elections. What purpose would they be wishing to achieve through a boycott? What result are they likely to get? In my view a boycott would only lead to SCAF staying in power a little (or a lot) longer, nothing else would be achieved. We need to go vote for whoever we believe is best for the country. Anything short of that is shooting yourself in the foot.